The quadriceps tendon is part of the extensor mechanism of the knee. 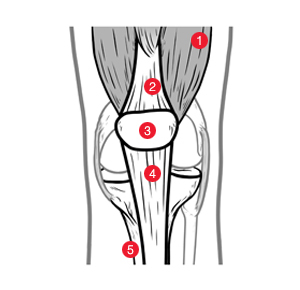 The quadriceps muscles attach to the top of the patella (kneecap) via the quadriceps tendon. This tendon covers the patella and continues down to form the patellar tendon, which attaches the patella to the tibia (shin bone). What is the main function of the quadriceps tendon? The quadriceps tendon works with the rest of the extensor mechanism to move the knee from a flexed (bent) position to an extended (straight) position. This makes basic activities such as walking and kicking possible. If your quadriceps tendon is ruptured, you will no longer able to straighten your knee, and walking or even standing on the injured leg becomes difficult because the leg will give way. If the quadriceps tendon is ruptured, instead of bending and straightening the knee, the patella can slip downwards. This is because the patella is no longer attached to the quadriceps muscles via the quadriceps tendon. 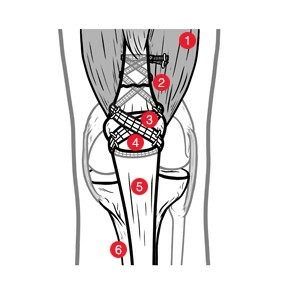 What are the main causes of quadriceps tendon rupture? One of the most common causes of quadriceps tendon rupture, particularly in older people, is a decreased blood supply to the tendon. Quadriceps tendon ruptures occur most frequently in people over 40 years of age. Another possible cause of quadriceps tendon rupture is a direct blow to the knee just above the patella, or by falling directly onto a bent knee. Quadriceps tendon rupture can also be caused by “excessive loading”. This is when stress is placed on the quadriceps muscle in such a way that it is made to contract at the same time as being stretched. This places excessive force and tension on both the quadriceps and patellar tendons, and can cause damage to either of them. Excessive loading can occur when landing with the foot flat on the ground and the knee slightly bent, after jumping from a height. What is the difference between a partial and a complete quadriceps tendon rupture? A partial rupture is a rupture or a tear which does not span the entire width of the tendon. The tendon is therefore not completely ruptured, but it is still damaged. Partial ruptures are usually treated conservatively (non-surgically). In a complete rupture, the quadriceps tendon is completely split across its width. Surgical treatment is usually necessary for complete ruptures. Conservative, or non-surgical treatment is generally used to treat partial tears of the quadriceps tendon (where the tendon is damaged, but has not been completely severed). The knee is immobilized in a brace or plaster cast for up to six weeks, in a straightened position. This is generally followed by physiotherapy, which may focus on bending and straightening the knee to strengthen the tendon. Surgical treatment is generally recommended to treat complete ruptures (where the quadriceps tendon is completely severed), as patients with complete ruptures may be unable to walk unaided. There are various different surgical options available. For more information, please click the buttons above. Typical surgical treatment for quadriceps tendon ruptures can involve autografts. This is where tissue is taken, or “harvested” from another part of the patient’s body and implanted at the site of injury to repair the quadriceps tendon. Disadvantages of autografts can include weakness in the area from which the harvested tissue is extracted. This is known as donor site morbidity. Autograft tissue also tends to debilitate (lose strength) when it is harvested, as the tissue suffers necrosis (tissue death). Some strength is gradually regained after the autograft has been implantated, but this can mean a longer recovery period. Alternatively, allografts can be used to repair a ruptured quadriceps tendon. These are similar to autografts in that harvested tissue is implanted at the injury site. However, unlike autografts, which come from the patient’s own living body, allograft tissue is cadaveric and comes from a donor. Like autografts, disadvantages of allografts can include a longer recovery period due to the initial loss of strength in the harvested tissue. Weakness in the area from which the tissue is harvested is eliminated with allografts, as the tissue comes from a donor rather than the patient’s own body, however there may be some risk of disease or infection transmission from the donor tissue. Synthetic grafts are similar to autografts and allografts, but instead of repairing the injury using tissue harvested from the patient or a donor, a synthetic implant (such as Neoligaments’ QuadsTape) is used. Unlike autografts and allografts, there is no donor site morbidity or weakening of other areas of the body and no tissue necrosis, which can mean a shorter recovery period. There is also no risk of disease or infection transmission as there can be with allografts. The Neoligaments 30 mm x 800 mm Poly-Tape implant (QuadsTape) is indicated for quadriceps tendon reconstruction. The QuadsTape is a textile implant made from polyethylene terephthalate (polyester), which has been in use for the reconstruction of ligaments and tendons for more than 25 years. Its open weave structure acts as a scaffold and encourages tissue ingrowth, where tissue grows into and around the gaps in the device, adding additional strength to the repair. 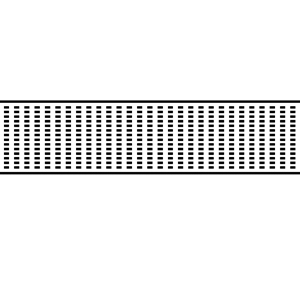 The open weave structure of the QuadsTape acts as a scaffold and allows new tissue to grow through and strengthen the repair (tissue ingrowth). No need to harvest tissue or grafts from anywhere else in the body, which makes for a shorter operative time as well as a shorter recovery period; particularly advantageous for active people. Use of small incisions (minimally invasive) rather than “open” surgery makes the procedure suitable for patients who may have problems with wound healing (such as elderly patients, or patients following a steroid programme). Specialized postoperative rehabilitation regime developed in conjunction with a leading physiotherapist. The QuadsTape is passed through the patellar tendon, just under the kneecap. It is then crossed over the kneecap, and passed up through the quadriceps tendon and muscles to make a figure-of-eight shape. The ends of the QuadsTape are knotted to secure the repair, and trimmed to length. All of our rehabilitation regimes have been developed in conjunction with Ian Horsley MSc, MCSP, Clinical Lead Physiotherapist, English Institute of Sport (EIS) North West, of BackinAction Physiotherapy and Sports Injury Clinic, Wakefield. Below is a brief outline of the prescribed programme following surgery with the QuadsTape. If you would like to see the full rehabilitation programme, please click the link below. Rehabilitation programmes should always be supervised by a specialist physiotherapist, and prescribed activity levels should not be exceeded before complete healing has occurred. Full weight bearing using crutches for stability. A brace or splint is used to allow the patient to mobilize between physiotherapy sessions. Balance exercises and static cycling are commenced. Brace and crutches are discarded. Rowing machine/stepper/cross trainer are commenced on low resistance. Resistance to exercises is increased. On agreement with the physiotherapist, return to activity is allowed. The technique for quadriceps tendon reconstruction using the Neoligaments 30 mm x 800 mm Poly-Tape (QuadsTape) was developed in conjunction with Mr. A. D. Toms of Royal Devon and Exeter Hospital, and Mr. S. H. White of Robert Jones and Agnes Hunt Orthopaedic Hospital.